Do you live a busy lifestyle that doesn’t leave much time for cleaning? Perhaps your active lifestyle means a lot of water and dirt make their way in to your home. Whatever life you lead, you can make it easier by getting waterproof flooring in Yorkton, SK. Visit our well-stocked flooring showroom to peruse our selection of waterproof vinyl flooring, tile flooring, and many other types of flooring materials. Our knowledgeable and friendly staff is always ready to discuss your project and help you choose the perfect floors to suit your style and project budget. Whether you choose waterproof carpet, vinyl, or laminate flooring, we have a full variety of styles, colors, and patterns. Stop by today to talk to our sales and design professionals about your needs. Our waterproof flooring is suitable for any room in your home, from the kitchen and bathrooms to the bedrooms and living areas. Waterproof vinyl, carpet, and laminate floors are not only waterproof – they’re also stain and scratch resistant. This makes them ideal for home with heavy foot traffic, pets, children, and frequent activity. Waterproof carpet is a durable and long-lasting material that is also able to repel and dispel strong odors from pets, cooking odors, and smoke. With regular vacuuming and prompt clean-up of spills, your carpet is sure to look and function well for many long years. As a member of a huge national chain, we have access to most of the leading brands of flooring. From waterproof vinyl flooring to plush and comfortable carpeting, you can find everything you need by leading manufacturers. Check out our modern styles that are as durable as they are beautiful. We even have waterproof laminate flooring that imitates the look and feel of hardwood and natural stone. Tell our design experts about your lifestyle, personal style tastes, and budgetary needs. We’ll come up with recommendations from our extensive selection. Stop by our showroom to view a selection of floors by leading brands including Mannington, Karndean, Tigressa, and Triversa. 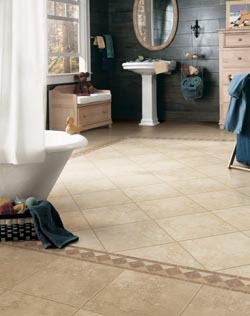 Protect your investment by scheduling waterproof flooring installation with skilled contractors. Experienced installers remove all your old flooring, properly prepare the subfloor, and install your gorgeous new floors so that they last for many long years. The quality of your new flooring installation is just as important as the quality of the flooring you purchase. That’s why we suggest a professional install, to ensure your floors look great and last long. Contact us to choose from a full selection of waterproof flooring options. We’re proud to serve clients in Yorkton, Wroxton, Willowbrook, Kelliher, and Ituna, Saskatchewan, as well as the surrounding areas.